The author wishes to thank the readers for all their kind interest, letters with enlightening questions, and protests as well, concerning the paper "Dating the Oldest Egyptian Star Map" . By this treatise, of July-August 2000, Ove von Spaeth introduced an astronomical method (developed by OvS 1984) for an exact dating of the star map of Senmut (Senenmut). The treatise in question was published in: "Centaurus International Magazine of the History of Mathematics, Science, and Technology" 42;3, 2000, pp.159-179. The resulting date and its possible consequences for a more precise dating of historical events, not only in Egypt but also in ancient Near Eastern and Mediterranean cultures, may, by its interesting perspectives, contribute to the needed enhancement of their chronology. * Observe: The following answers are connected to specific questions concerning the original text of the treatise and should not be quoted as completely independent statements. On their own, such statements may not in a satisfactory way cover the right context in full. From the libraries' article-bases the copies (digital, xerox, etc.) of the treatise can be requested concerning the above mentioned issue of Centaurus. It has the reference No. ISSN 0008-8994. Or the treatise to be downloaded via web-page "The Senmut Star Map Decoded". 1. It might be useful noticing that Senmut’s star map was constructed and installed a number of the years later than when the calculated and recorded celestial events took place. 2. Also notice that the map is recording even several celestial events having taken place individually at different times although they are still gathered on the same map. 3. Senmut’s map design is by some principles the same as depicted on clepsydras (‘water-clocks’) but it is the first time to our knowledge that such a detailed big star map has been seen in total. Clepsydras seem to have existed prior to Senmut but have not been found. A frequently asked question, which seems to be of special interest (though unimportant for the exact dating of the star map), is the dating of a solar eclipse in connection with the appearance of the planetary grouping shown on the Senmut star map. The map did not predict an eclipse - but indicates having recorded one. First of all, this does not mean that the eclipse had to be visible in Egypt. A missing visibility should not be a condition to avoid notifying the eclipse on the star map. However, this is not what many critics wrongly have presupposed without scientific basis. According to some of these critics' calculations (done without advanced astronomic computerprogrammes or knowledge) the eclipse should instead have been observed in e.g. "the South Passific" - thus they create artificial problems. The ancient Egyptians were able to calculate or record the existence of the eclipse in any case. See additionary information in paragraphs 5, 9, and 11. Furthermore, even a variation of plus/minus some hours for the eclipse appearance does not disturb the dating of the celestial arrangement as depicted on the map. The fact that alternative methods of calculation might make some difference seemed too obvious to mention. Nevertheless, it now seems that an added note serving this purpose would have been appreciated. (And to the following, when somebody might suggest alternative hours for the eclipse, this could not in any way be surpassing or changing the option already given for the fixation of the hour). Note, please, the fact that all years B.C. when appearing in Ove von Spaeth's texts concerned are counted without a year zero - thus, for the sake of historians and Egyptologists. All this was established in order to be in accordance with historians' older historic references, materials, and whole tradition. A residual from Julian calendar style, for instance, the year of 1534 B.C. will thus be equal to the astronomy-counted year of "minus"-1533. This was done in favour of the historians and Egyptologists who may have more difficulties by changing from one system to another, than in the case of e.g. astronomers who can be helped by their special computer programmes. The expanded account (also supported by Owen Gingerich, Research Professor in Astronomy and the History of Science at the Smithsonian Institution) states that the experts did not have accurate values for the secular acceleration in ancient time, and thus the correction between ephemeris time (for which the ephemeris tables were made) and universal time (the observed quantity) was not precisely known. This would have a considerable effect on the position of the path of totality for a solar eclipse, but comparatively little on whether or not a partial solar eclipse could be seen. Independent of the planet-calculation theories the most important matter is that the result strongly depends upon the choice of formula of Delta-T for the ephemeris time. Regarding some specific technical questions, problems similar to the one cited above, may arise when using the theories of e.g. Bretagnon or Chapront and others, all making use of the best modern theories (contributed also by the most recent measurements of the Moon's conditions of distance and velocity etc. - e.g. achieved by laser beams reflected from mirrors placed on the surface of the Moon). We only know of approx. 180 Delta-T values of the years from 1620 AD and up to around 2000 AD. (cf. Jean Meeus: "Astronomical Algorithms", Richmond, Virginia 1991, table 9.A) They are from the time where astronomers - a few - began to make records of their observations. From approximately 1660 the records being more precise, and around 1750 the number of records extended sufficiently to make some simple statistic calculations of Delta-T for this short span of time. This scarce material of merely approx. 180 years without any regularity of the Delta-T values varying between +124 to -6.7, naturally, is not possible to use as any safe base of calculating Delta-T the 3.500 years back in time. Even extrapolations by the best of today's techniques are not able to produce a result just roughly precise. This uncertainty is why there already exist several ingenious theories for using Delta-T for going back in time! And they all end up with different results none better than the other. Formulae based on such theories as presented e.g. in "Nautical Almanac" are not, and never were, authoritative. Surprisingly, very few take into consideration or even know about the existence of several competent but different theories. This goes, too, for ready-bought lap-top astronomy device as well as some even more powerful computer programmes of astronomy. To some degree these actions clearly have ameliorated the Delta-T function, though it is still somewhat far from being satisfyingly dependable concerning certain ancient historic astronomical questions. Thus, a Delta-T value for ancient times is not possible to fix or extrapolate even to be 60-70 percent correctly, and nobody should have any firm "religious" beliefs that one of these values or figures - unavoidingly being "relative" - should constitute any "absolute" figure. Calculations with one or another of these figures, as have been done frequently in modern literature on ancient time's astronomical phenomena - and from there, comparing the results with the result presented in the paper on Dating the Senmut Map, and then trying to show the latter being wrong, is not possible by a true scientific view. 4. Which Theory to Be Applied? Moreover, by applying more recent improved formulae when calculating the time of an ancient eclipse, it would not always be sufficient just to select a fixed formula from some of the new publications on the subject. This is because the perturbations of the ephemeris time, over epochs of long duration, often are unpredictable: In order to arrive at a more realistic result, the method of using one formula for the years back to ca. 1600 AD, another for the years back to ca. 400 AD, and yet a third for going still further back, etc., will often prove preferable (e.g. Jean Meeus' "Astronomical Algorithms" [Richmond, Va.,1991 and later updating] would also be of some help). The results of these kinds of methods, however, are not final and in the future, of course, new improvements will still be achieved. It will still be the case in the years to come: the ephemeris time still has no empiric fixed value, thus it is hardly possible to calculate/predict with a sufficiently high precision. In order to cover a vast number of variations in the elements of planetary orbits, a full-scale operation of the collection of formulae, such as the one known as VSOP 87, would demand thousands of components of formulae for most of the celestial bodies; yet, in each case, a few hundred were sufficient when analysing the Senmut star map. We must (also) emphasize F.R. Stephenson's excellent "Historical Eclipses" (1997). It goes far back, e.g. to be used in connection with the famous earliest solar eclipse of the Babylonian record (763 BC); and even for a fair dating of one of the oldest Chinese records of an eclipse (1050 BC). Stephenson's "Historical Eclipses" is p.t. one of the best publications in this field, but still it must be borne in mind that the Senmut star map is 500-800 years further back in time. As for the eclipse in the texts of the Senmut star map, nothing is said concerning the visibility of the solar eclipse. The important point, however, is that the conjunction of sun/moon (and here, as it turned out, as an eclipse) was recorded on the map at all. Other questions concern the ability of the Egyptians to calculate the positions of celestial bodies and eclipses. Greek historian Diodorus Siculus stated (ca. 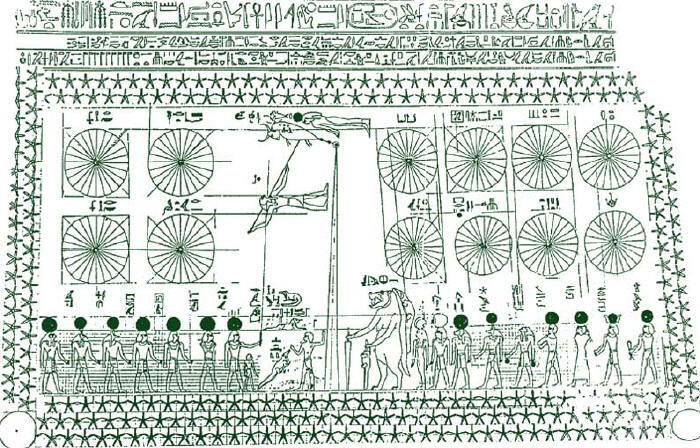 50 BC) categorically that the ancient Egyptian astronomers possessed the ability to predict solar eclipses. Greek author and scholar Plutarch (46-125 AD) related that the ancient Egyptians explained solar eclipses by the passage of the Moon between the Sun and the Earth in daylight hours. Further, the famous "Vienna Papyrus" describes lunar and solar eclipses and their implications and presents great knowledge of astronomy. More so, Greek-Egyptian scholar and Father of Church, Clement of Alexandria (150-215 AD), relates to temple libraries containing a 36- (or 42- or even) 50-volume book-series "of Thoth" preserved by the priests of ancient Egypt - four of the volumes treating astronomical subjects. One book dealt with the "constitution of the Sun and Moon" and another "the conjunctions and variations of the light of the Sun and Moon". In these books it was axiomatic that it was a valued skill of the ancient Egyptian astronomer-priests to predict eclipses. The books were collected by the founder of the Alexandrian library, king Ptolemy II, ca. 300 BC, from all of Egypt's ancient temple libraries - the texts being often from traditions far more ancient than any early Greek influence. In 1930 some Italian archaeologists found an Egyptian temple library containing approx. 500 volumes beneath the 2,300 years old Tebtunis temple ruins, in Fayum. Considerably many of the books concern astronomy and astrology. It is the only temple library of ancient Egypt of which substantial remains are preserved. (Today, most of the immense literary material is at the Berkeley and Michigan Universities, British Museum, and the Carlsberg Collection, Copenhagen). By his access to similar ancient Egyptian sources and, of course, later Greek sources, the Egyptian-Greek historian, hieroglyph scholar, and stoic philosopher, Chaeramon of Alexandria - who ca. 40 AD was the chief librarian of the Alexandrian Library - wrote several treatises on the stars and about comets. A small temple from Debod - in an area of Lower Nubia since 1960's permanently flooded - was originally constructed in 200 BC, conditioned to completely adapt the very old traditions of Egyptian temple architecture. However, today it is saved from the flooding and reconstructed in Madrid, Spain. In order to preserve what was a treasure of highest value also this temple has a special room, the temple library: pr mDAt , the 'house of books'. Like other similar known temple libraries, e.g. in Denderah and Philae, the Debod temple library contained texts of sacred contents, as well as astronomy, medicine, besides administration papers and inventory lists, etc. On the walls of the library room ancient graffiti showing astronomical notes, diagrams and geometry, the golden section or ratio, etc. - a further physical proof of this culture's wide-spread organized astronomical knowledge. The very existence of the precise planetary positions on the Senmut star map, and on other star maps of that era ca. 1500-1300 BC, demonstrates an expertise concerning the calculations of planetary positions. The fact that these maps include such details as a retrograde planet - Mars - and a solar eclipse position (proven to be exactly as stated on the Senmut map), exclude any possibility of coincidence. A thousand years before the time of Senmut, the astronomer-priests were developing such skills by constant observation of the firmament, which necessitated the keeping of accurate records, especially with regard to calculating celestial positions and cyclic phenomena. The data were used for the sun- and star-related calendars as well as the "star clock". Records of such astronomical calculations, however, do not seem to have survived, although there are examples of very ancient calendars. But as documented by e.g. inscriptions - a planet "...travels backwards..." - a retrograde movement of a planet placed opposite to the sun was a well-known phenomenon (cf. the paper's paragraphs 3 and 6, and note 3). The precise positioning of planets by observing them, even in bright daylight, from the bottom of deep wells or shafts directly (and probably less by oblique mirror-reflection in a water surface in the well), was a widely known practice in all ancient cultures. NOTE (5a): It has been doubted - under the modern time's drawback of historical knowledge - and has been called "a myth" that astronomers of ancient times were able to use wells/shafts at all, in order to make observations from them. Besides, especially Venus - and also e.g. Jupiter in some cases - can sometimes be daylight objects. Plato (428-348 BC) mentions that the philosopher Thales of Miletus (ca. 640-547 BC) had an accident in a well while observing the stars. - And the Greek author Aesop (ca. 620-560 BC) tells similarly concerning another astronomer in a well-shaft. An ancient apocryphal text, ca. 100 AD, from Syria which at that time was influenced by Christianity, tells about the magoi, i.e. some Babylonian astronomers and astrologers, who by observing a certain star (later called "the Bethlehem Star") by the mirroring water surface in a well in Northern Palestine, were able to calculate and find a certain local direction. None of these events would be understood by contemporaries, if this practice was not well known. Furthermore, today it is frequently forgotten that through the entire era of antiquity much of the important information was, quite normally, conveyed and preserved by presenting the very facts and data of the information as a dialogue or a mythically formed narrative. One of the most learned and respected Greek scholars, Eratosthenes (276-194 BC), director of the great Alexandrian Library, calculated the circumference of the Earth by also using a great well shaft, with a staircase to the bottom - to observe the lack of shadows by the sun's meridian passage at summer solstice. This well - a Nilometer from ancient pharaonic times - is situated on the Elephantine Island in the Nile at Syene (Aswan) in Upper Egypt. However, today this event as well as the method are being claimed a myth by some academics. On the contrary, the great thing is that there was a very ancient knowledge concerning the existence of the measure of the Earth's circumference - and also great that Eratosthenes from the said depots of knowledge was thus able to catch the information of this and the method to prove it, as measuring shadow angles was a very old practise in Egypt. A great civilization during several thousands of years has, naturally, accumulated large amounts of knowledge. If it wasn't so, then we should be surprised instead of somewhat arrogantly claiming that things we, in the present, do not fully understand are just a myth - as in the case of accounts about the great knowledge of the ancients. Even the mathematical and astronomical skills may only represent a fraction of what they really could have known. Furthermore, one of the oldest known Egyptian presentations of a planetary position, places Jupiter close to the decan (celestial sector of 10-degrees) of Sirius. This dates back some 4200 years, and is recorded on a fragment of a starclock-diagram depicted inside a coffin-lid (on Heny's coffin) - one of the traditional methods of recording. NOTE (5b): The application of geometrical calculations to the numbers in use by the astronomy implies a highly sophisticated stage of mathematic-geometrical skills by the ancient Egyptians. Indeed, this is confirmed by the mathematical (and geometrical) Papyrus Rhind, ca. 1650 BC. Egyptian knowledge was famous - and in later times, Pythagoras coined his theorem of the right-angled triangle, ca. 550 BC, after having studied 22 years in Egypt (and some years in Babylonia too). - And Plato defined the Platonic solids, ca. 400 BC, after his 13 years of studies in Egypt, according to his pupil Eudoxus. - Especially Thales of Miletus brought geometry from Egypt to Greece and systematized it to an extend which became culminating in Euclid's work "The Elements", 300 BC. In the case of Thales it is interesting that the Egyptians de facto knew trigonometry with tangent etc. The concept of pi was known in Ancient Egypt. Much later, around 250 BC, Archimedes of Syracuse found that pi is somewhere about 3.14 (in fractions, Greeks did not have decimals). The digits of pi never end, nor has anyone detected an orderly pattern in their arrangement. Furthermore, pi is a transcendental number, i.e. a number which can't be expressed in any finite series of either arithmetical or algebraic operations. Pi transcends them. And pi is indescribable and unfitted to all rational methods to locate it. For the present, we don't know to what extend this knowledge was perceived by the ancient Egyptians. When pi was applied to the more practical works all the conditions were not necessary to bring about. Earliest known Egyptian written reference to pi occurs in the afore-mentioned Papyrus Rhind - cf. below, note 5c - a scroll made by the scribe Ahmesis of 15th Dynasty reign (Middle Kingdom era) of the Hyksos pharaoh, Apepi I. NOTE (5c): The advanced levels of studies by the ancients were connected to the religious-mystical tradition, and in the Papyrus Rhind the opening words state about the document's own text that it is: "The Entrance Into the Knowledge of All Existing Things and All Mysterious Secrets". This scroll presents 87 various mathematical problems and their solutions. Problem 48 and 50 concerns the area of a circle to be found by using - probably for practical reasons - a rough sort of pi (here, 3.16049): to let the area of a circular field with a diameter of 9 units be the same as a square (quadrilateral) field having a side of 9 units. The scribe Ahmesis remarks that he has composed the scroll "in likeness to writings made of the ancients" - in this case: the time of pharaoh Amenemhet III (1842-1797 BC). The 5.5 m long Rhind Papyrus scroll, found in the ruins of a small building in connection with the Ramesseum at Thebes/Luxor, was here acquired in 1858 by lawyer and excavator Alexander Henry Rind. Several indications for the knowledge of pi exist and are going much further back in time, e.g. the 4th dynasty, 2500 BC, when integrated into the construction of the pyramids and their manifest star-positions-related orientation. 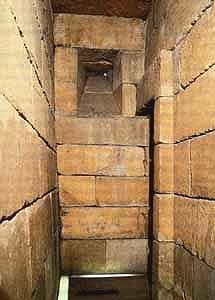 Moreover, a precise knowledge of pi was existing even before the pyramids, thus more than 4,500 years ago. An important Egyptian measuring-unit is the cubit, which has an exact pi-relation to another Egyptian measuring-unit, the remen. Here, 1 remen constitutes the radius of a cubit-square's circumscribed circle. Thus, these two standard measuring-units were more easy and correct in use than calculating by fragments. Most often it would be a premature conclusion just to state that unexpected words or forms in a text from an ancient historical material derive from being wrongly written or copied. Other possible solutions should be examined thoroughly. The observation that the Senmut-map presents a concrete celestial conjunction 1534 BC seems to be supported by the subsequent maps in the following centuries demonstrating that these conditions are reflected here, too. These maps use the Senmut-model, but probably due to small changes in the conjunctions - e.g. in connection with Mars - the pattern, accordingly, has been changed slightly. Therefore, in most cases these differences were not caused by erroneous copying but by accepted and necessary flexibility. Only in much later times clues may point to astronomers being less involved, or not involved at all, at the construction of the maps often giving the impression of being slavish copies. The treatise's translation p.166 concerning tms hntt (or tms(n) xnt.t by the Schenkel-system) has been disputed. We know that the last of these Egyptian words, hntt , is always a noun. Accordingly, the translation would be expressed like "the red in (an) upstream-sailing" (cf., too, Erman & Grapow: Wörterbuch der Aegyptischen Sprache, Band 5, Seite 309). Concerning the planets connected to the boats depicted in their astronomical positions on the map, expressing the nature of the planets' movement (cf. the treatise's p.164 and 166), the "upstream-sailing" constitutes the most excellent description of the red Mars (in its west-to-south position) and its sliding movement towards the southern sky. This kind of literally translation would of course be less intelligible to e.g. historians and astronomers, to whom the inter-disciplinary information of the treatise is directed as well. Nobody except Egyptologists would have a chance of knowing that "upstream-sailing" was a common phrase connected with the sailing towards the South, originally referring to the Nile as the all-dominating orientation-axis South/North. By this the translation, as presented in the treatise (p.166, "the red travels/sails southwarth"), provides a valid interpretation of the full meaning of the Egyptian expression, bearing in mind that it is not always possible to translate the Ancient Egyptian language into plain English in a "direct form". Concerning the above mentioned tms n hntt on the Senmut star map - cf. the treatise's paragraph 3 - the following note may be added: The early existence of several variants of this expression is well known, e.g. tms n hnt and tms n hnty etc., several of which go back to the star clock diagrams belonging to the early coffin groups (ca. 2200 BC). However, the precise combination in our case, tms n hntt , seems to be found on the Senmut star map for the first time. And it would not be possible to signify Mars by other variations hitherto known concerning the spelling and combination. In the actual situation Mars fits extremely well and with a very high degree of plausibility. Being aware that by itself this is no final proof - it is, nevertheless, a strong indicator well supported by astronomy and by the context. Furthermore, it is a fact that by the ancient Egyptian concept Horus is specifically represented in the bow of Ra's boat - as is Horus of the Dwa.t - cf. tradition like in the "Pyramid Texts" 1000 years before Senmut's time. This is coupled with the fact that the bow, knt , of this boat is signified by almost the same name (cf. Egyptian tradition of widely using strong "word-plays") as the presumed Mars-boat on Senmuts star map. This is a name/word appearing elsewhere as Hr knt which is an epithet of Horus as a star-god (cf. that in numerous cases Horus is used, too, as an indicator of planets) - all of this also signify the existence of Mars on the Senmut map, which accordingly is showing the true location of Mars in the real sky at the very time of the conjunction. You have to see more material about the whole connection in the treatise. According to Neugebauer & Parker ("EAT III", p.113): "... the meaning of 'rt is unknown ...". Yet, this condition seems to be excluded in case of looking at the whole context concerning the decans no.31-35 on the Senmut star-map. Here, in decan no.31 the hieroglyphs spell 'rt Hr (iret Her) , i.e. "Horus' eye", the meaning of which has always been accepted also as "the eye of the Sun or Moon". Being aware that in several cases some decans may be submitted to the same god, this will have no influence on the matter being demonstrated here. In Ove von Spaeth's paper in "Centaurus" (42;3, 2000) it is shown on p.171, by e.g. the authoritative translations of "Book of the Dead" that by being connected to the word jatet the expression in question means "eclipse" in this source as well as in similar contexts. The word jatet is not to be found in decan no.31 or its vicinity, but there are other signs (recorded in the paper) showing the astronomical proven eclipse, which is indicated on this map very exactly. The exactitude and reliability are due to the extraordinary professional construction of the Senmut star-map. One of the bases for this step demonstrates that reasons of tradition and readability would prohibit Senmut from changing the names of the decans or make any essential additions to them to fit his purpose of marking the (astronomical proven) eclipse. His alternative option was to move decan no.31, and hereby the text "Horus' eye", the Sun/the Moon", to about 2-3 columns away to hit the exact spot on the map, in accordance with the, already proven, celestial position where the eclipse took place. (Senmut's moving of these decans is confirmed by Neugebauer & Parker). In this way any professional and experienced ancient Egyptian astronomer, unavoidable, would have to be aware of the little, yet unusual break of the normal sequence of decans - and, further, from the decan's text to connect to the Sun and its conjunction with the Moon - thus becoming aware of indications of the special condition, namely the eclipse, which is precisely to be located by the new placement of decan no.31. The paper of Ove von Spaeth brings to light, p.172, the indication brought about by Senmut's well known (Neugebauer, "EAT") "reshuffle" of decans no.31-35 within their limited celestial sector that his action has been provided in order to achieve several benefits to this map-construction by its expression of the actual celestial event. Among these decans a special one seems to be demonstrating the eclipse. This is in full accordance - and an elegant move too - with authoritative agreements about ancient Egyptian tradition (e.g. making unusual changes in the layout of a hieroglyphic text or in the features of a statue intending to present an extra meaning or message beyond what is contented in the ordinary text or figure). Furthermore, this is supported by traces of the tradition's pattern or "standard" in the context. Also the similar conjunctions on later star maps - of Amenhotep III, Seti I, and Ramses II - include new moon exactly as in the true astronomical reality. One new moon being a solar eclipse (possibly visible) in the case of Rameses II. Concerning the visibility at any location it should be recalled, especially because of the unpredictable Delta-T (cf. above: section 3) that not even the newest formulas as well as the newest publications of solar/lunar-planetary tables are able to prove an exact time of appearance of an 3500-year-old eclipse. Therefore, it will be contra-productive to dismiss the eclipse-date proposed in the paper and then proclaim another eclipse-time to be "more correct" by a counting based on some other of the new tables. As stated elsewhere, this eclipse does not have to mean anything for the exactness of the dating of the map, but once discovered it was too tempting to present this information. The basic data and facts are found in the paper in question. Whereas the text, belonging to Fig.4 on p.173: "hieroglyphic signs for a solar eclipse ..." may benefit from being expressed as: "... hieroglyphic signs, which should lead to indications of the solar eclipse ...". To calculate or fix precise dating of the pharaohs of the 18th dynasty is a well-known problem, and questions have been asked about this in relation to the Senmut map. The matter is, however, quite outside the framework of the investigation presented in the treatise. On p.171 is stated that the problem deserves its own research (and may then be supported by the data of the star map, as the exactness of astronomy still being one of the best tools for fixing the drifting or relative dating of e.g. the 18th and 19th dynasty). Concerning the 18th dynasty Egyptology has, hitherto, dealt with "relative chronology" in lack of "absolute chronology". At the international scientific congress about "absolute chronology" it was demonstrated that astronomy confirms a high-date time-frame and is the most precise dating method. Cf. Erik Hornung, & Wolfgang Helck, & Kenneth A. Kitchen, et al. : "High, Middle or Low?" I-II, Acts of International Colloquium on Absolute Chronology" held at the University of Gothenburg 20th-22nd August 1987. These inferences are supported by a substantial amount of dating-material based on already existing, scientifically exact time-measurements from archaeology, dendro-chronology etc. concerning ancient Eastern Mediterranean cultures. - Especially, the dating of the Santorini-vulcano's gigantic eruption as an important agreed-upon time-reference to history and archaeology (e.g., C. Hammer et al. : "Minoan Eruption of Santorini in Greece Dated to 1646 BC", Nature, Vol.328, 1987, pp 517-519 - naturally, with more reliable details than C-14 methods applied so far back in time). All of which will cause chronology of the actual period in Egypt to be moved about 15-30 years back in time (varying, depending on which of the Egyptologists' systems being applied). This, too, demonstrates to fit exactly with the result of the decoding of the Senmut star map. Questions about the conjunction of 1534 BC taking place already within the earliest years of Senmut's lifetime: The date of the conjunction fits easily with the star map being depicted about 35 years later, when Senmut was the high-ranking administrator of government under Hatshepsut. Likewise, similar conjunctions in the era of e.g. Seti I, Ramses II etc. appeared within their lifetimes and even within their reigns. Astronomy states the time of the conjunctions depicted on several star maps, and the inscriptions showing their owners. To make these persons fit in, chronologically, is a task for Egyptology, not astronomy. As a first step the low-dating (in use by a number of schools of Egyptology) of the era in question should be dismissed. The decans, star clocks, and star maps varied during the lengths of traditions. Regarding traditions which are older than Senmut's star map, the treatise's text p.164 refers to sidereal clocks/calendars of the decan diagram-type. For instance, the information from the "Heny's Coffin" from the time of Old Kingdom (covered by p.164's reference to Pogo 1932) is, as a fact, not sufficient to make a real star map. Another example is an astronomical diagram from the time of Middle Kingdom, mentioned by Osing & Rosati 1998 (not specified in the Bibliography in the treatise), consisting, too, of only pre-stage elements anticipating the real star map like the one found for the first time in the case of Senmut. Skepticism is of course indispensable as it contributes to our research by obtaining better information. Given that there is no safe way of extrapolating so far back in time, it would of course be risky to give the exact hour of an eclipse 3500 years ago, as has been the case in the paper discussed. (It was intended to serve as an additional illustration of how precise the information of the Senmut map might be). As stated above, it is of no significance for the basic dating of this star map. In any case, the general positions in the sky for the Sun, Moon, and all the planets are correct and unambiguous. And here the rare and unusual clue provides further confirmation: the retrograde Mars is one (but not the only one, of course) of the most important factors! (We may recall that a retrograde Mars can be of great help - as it once, in quite another and greater matter, puzzled Tycho Brahe, and from him Kepler inherited this problem and investigated it further, ending up with his new system). Errata. For the sake of good order it should be mentioned that minor misprints unfortunately appeared during the print editor’s formatting of the manuscript and again during the last phases of the printing-process of Centaurus 42:3 - but will certainly not be of any possible effect of changing the understanding of the context - and can be found (in some of the first prints) at: p.159 Seinenmut, read Senenmut; p.164 12-month circles, read 12 month-circles; p.166 Hrt dsr , read Hr dsr ; p.175 (at 1533 June 10:) "Rx" is, incorrectly, moved away from its connection to Mercury; p.177 Meus, read Meeus; p.178 Helk, read Helck; p.179 n.3 1497 BC and 1496 BC, read 1297 BC and 1296 BC - and n.5 Fourrier and Galliot, read Fourier and Gaillot. And in the next issue of Centaurus (42:4) in the Index for year 2000, unfortunately, the paper in question is mixed up with another paper. Section of Senmut's star map showing some of the decans of most significance. 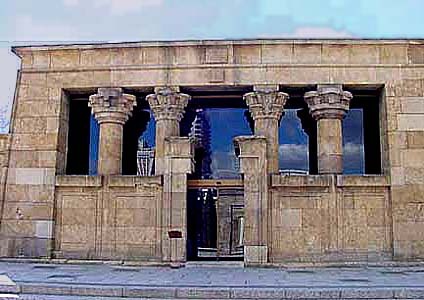 The ancient Egyptian temple in Debod (rescued in the 1960's from artificial flood in modern Sudan, the building now is re-established in Madrid, Spain). Among other things, it contains a library room (left), one of the most safe or protected rooms, the treasury, in any temple. It is known from finds in other temple ruins that the books, i.e. scrolls and documents, were considered as a real treasure including, especially, the many books on astronomy, mathematics and geometry.